Keeping it in the family: (l to r) Nigel Bennett, Sam Bennett, Andrew Bennett, Roger Bennett and Joe Bennett. 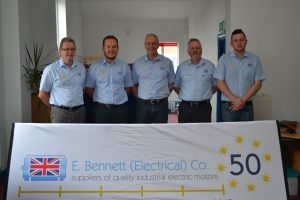 Family business E. Bennett Electrical has been keeping the wheels of British industry turning for half a century. Three generations of the Bennett family have worked for E. Bennett Electrical since it was founded in Burslem, Stoke-on-Trent, in 1965 by Harry John Bennett. The company is now run by Harry John’s sons, Andrew, Nigel and Roger Bennett and is a leading supplier of electrical motors, industrial controls and gearboxes to UK manufacturers. Meanwhile, grandsons Sam and Joe have joined the business which is continuing to thrive as it celebrates its 50th anniversary. The landmark was celebrated with a recent golf day for customers, suppliers and business associates during which £250 was raised for Breast Cancer Now. “Our mother, Eunice, died after suffering breast cancer and my wife, Catherine, has suffered and recovered from the disease, so it is a cause dear to our hearts,” said Roger. E.Bennett Electrical began trading from a lockup garage in Milton moving very soon to Burslem and made the short move to a larger building in Reginald Street, Burslem, in 1998. Roger said: “My father was an excellent salesman who built the business by buying in motors, refurbishing them and selling them on. “The business has since developed and we manufacture geared motors as well as supplying new AC motors and variable speed drives. We provide a full advice service and on-site consultancy and advice service for companies to ensure their equipment is installed correctly and runs efficiently. “We have extensive stock and provide a 24/7 service for customers. E.Bennett (Electrical) Company was established in 1965 and has gained a reputation for supplying quality goods and reliable service at competitive prices to end-users, resellers and OEMs. We specialise in the sales and service of electric motors, drives, Industrial Gearboxes and controls. Our consultancy services can advise on the best solution for your requirements, and identify areas where major energy and cost savings can be achieved. Our warehouse carry extensive stocks of motors, inverters, gearboxes and control gear and we aim to offer a speedy solution when a problem occurs. We keep large stocks in our warehouse and also maintain replacement stocks at customers’ premises – everything from standard products to specialist items to satisfy their particular requirements. Harry John Bennett started the company in 1965 using the E from his wife Eunice to form the name E.Bennett. He was joined later by sons Nigel, Roger and Andrew. Grandsons Sam and Joe have also joined the ever expanding ranks. As an independent company we have the technical support of all leading manufacturers including Brook Crompton, WEG, Danfoss, Wattdrive, Crompton Controls, Bauer, Hansen, Gamak, and Remco . Any electrical motor, drive or control not currently in stock can be obtained very quickly.